Federal Judge Blocks Texas Restriction On Abortion Clinics : Shots - Health News Requiring every center that performs abortions to meet all the standards of a surgical center is excessively restrictive, says the federal district court judge who blocked the state rule Friday. 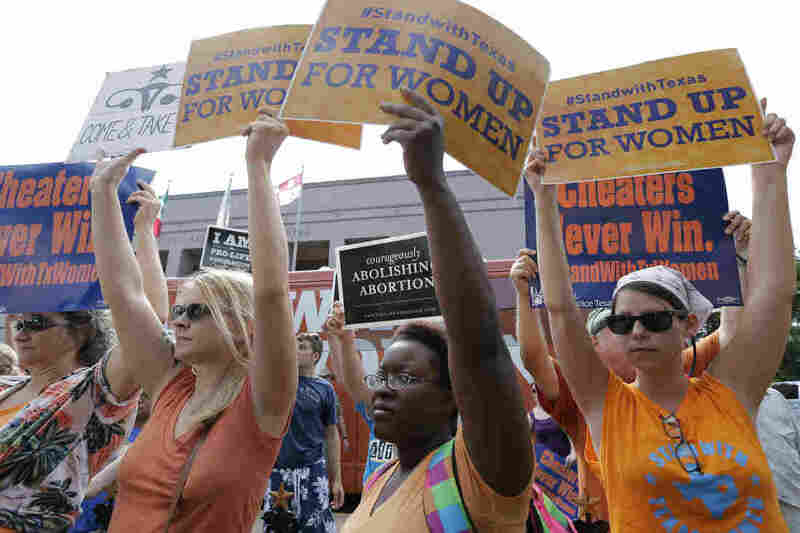 A federal judge in Austin struck down part of a Texas law that would have required all abortion clinics in the state to meet the same standards as outpatient surgical centers. The regulation, which was set to go into effect Monday, would have shuttered about a dozen abortion clinics, leaving only eight places in Texas to get a legal abortion — all in major cities. Judge Lee Yeakel ruled late Friday afternoon that the state's regulation was unconstitutional and would have placed an undue burden on women, particularly on poor and rural women living in west Texas and the Rio Grande Valley. Texas Attorney General Greg Abbott, a Republican running for governor, immediately filed an appeal with the 5th U.S. Circuit Court of Appeals. "We applaud today's ruling from Judge Yeakel," says Rochelle Tafolla, a spokeswoman for Planned Parenthood Gulf Coast in Houston. "But we also understand that the fight to protect women's access to medical care, including safe and legal abortion, is not over." Supporters of the law argued that the surgical center requirement would make abortion safer, but the judge found no health benefit. He ruled that the effect might actually be the opposite, writing: "Higher health risks associated with increased delays in seeking early abortion care, risks associated with longer distance automotive travel on traffic-laden highways, and the act's possible connection to observed increases in self-induced abortions almost certainly cancel out any potential health benefit associated with the requirement." Yeakel also noted that the intent of the Texas rule was to close existing abortion clinics, given that the state left no provision for "grandfathering" existing clinics that could not afford millions of dollars in upgrades to comply with the regulations that govern surgery centers. The doctor says that if the Texas law had been upheld, he would have had to stop performing abortions in his two office locations because they do not meet the surgery center requirements, which include particular hallway dimensions and certain equipment. He says he cannot afford to construct or purchase an outpatient surgery center, and leasing space in an existing center is difficult because other tenants don't want protesters around. "This was a good case," he says "There is no medical anything, anywhere, to show that having this done in a hospital or ambulatory surgical center is safer. It's nonsense; it's not. Complications are the same, risks are the same." With the day the law was supposed to go into effect fast approaching, the doctor says he told some patients who called this week seeking abortions to make appointments, but to keep in contact with his office.
" 'You call me, listen to the news, keep your fingers crossed and pray for the women of Texas to have their constitutional rights restored.' That's what I told patients today," he says. Texas Right to Life, a Houston-based group, said in a statement that "Pro-Life Texans are disappointed in the dangerous ruling and disconcerted by the prospect that the financial interests of big business abortionists are placed in higher regard than the safety and health of women. The women of Texas have been subjected to shoddy, sub-par and potentially dangerous abortion facilities for too long." In the decision, Yeakel, who was appointed to the court in 2003 by President George W. Bush, focused on poor, rural and disadvantaged women. He says the burden did not just involve the hundreds of miles some women would have had to travel. He says that distance had to be assessed along with other factors, such as the need for child care, the unreliability of transportation, the inability to take time off work, and even immigration status and the inability to pass immigration checkpoints. He writes in the decision, "When viewed in the context of the other state-imposed obstacles a woman faces when seeking an abortion in Texas — including a sonogram requirement, a waiting period, and the reduced number of abortion performing physicians resulting from the admitting-privilege requirement — the court is firmly convinced that the State has placed unreasonable obstacles in the path of a woman's ability to obtain a pre-viability abortion." The Houston doctor who says he's relieved by Yeakel's decision,also says he realizes he may have to cancel abortion appointments next week — depending on how the 5th Circuit responds. He says his patients have to become more proactive. "I'm there to support them in their right to choose," he says. "But you know, I'm not going to take the whole thing on my head. If they want it, they should be out there, actually protesting and voting too."